Along with the launch of the new Huawei P30 and P30 Pro, there’s some additional good news for those who want to purchase the company’s newest flagships! 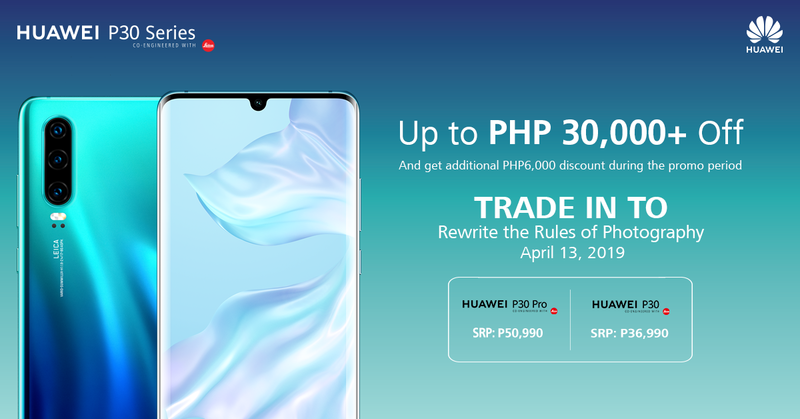 On April 13, 2019, you can visit the Huawei Concept Stores in SM Megamall, SM North EDSA, SM Cebu, or SM Davao to trade-in your current smartphone for up to PhP30,000+ off on the P30 or P30 Pro. A third-party agent will have your phone checked and assessed for its appraised value, which will be subtracted from the SRP of the new device. In addition, all consumers will also get PhP6,000 additional discount. For a list of smartphones that are eligible for the trade-in promo, click here. The Huawei P30 and P30 Pro are priced at PhP36,990 and PhP50,990 respectively.